Spring has all of a sudden turned into summer but I am not complaining yet, because after 30 plus inches of snow we got in February, I am not minding a little heat. 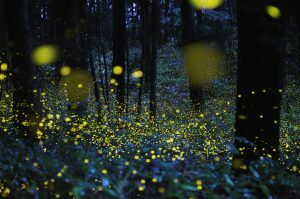 What I do love about this time of the year, late spring-early summer, is the anticipation of seeing the fireflies in our midst. I love fireflies, I am fascinated by them. 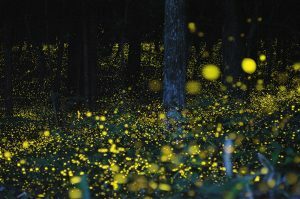 I did not grow up seeing fireflies and still after 15 years in this area, I still find them beautiful and mesmerizing. My first encounter with fireflies, which is the first time I heard of them, was in the Disneyland ride, Pirates of the Caribbean. If you are a Disney fan, you know what I am talking about. Seriously, I never knew they existed. So what a wonderful surprise it was to me and my kids when we saw them for real, all around us, in our backyard and in our trees! I remember saying, wow, this is like Disneyland, but better! At the peak of the season, they are randomly flying around the trees and bushes turning their lights on and off making the trees resemble a Christmas tree with lights. Our local park, in the dark appears as if it was one giant Christmas scene of trees with Christmas lights flashing. It is really spectacular! I call it Christmas in early summer. They are not flies, they are not bugs, they are actually beetles. There are about 200 species in the world. In North America, there are over 150 species of fireflies. The Photinus species produces a yellow-green flash. They live in warm climates, love moisture and humidity. Each species has its unique flash pattern and not all fireflies flash. Flash patterns vary in color, length, number of flashes, interval of time between flashes, time of night they are active, and light pattern…..wow! Go figure all of that! Females deposit the eggs on the ground where they live feeding on snails and smaller insects. Most larvae are subterranean or semi-aquatic. The firefly larvae do not blink but rather glow as a defense mechanism indicating they are not very tasty. Firefly larvae take 1-2 years to mature into adulthood, once adults they do not eat at all and live only for about 21 days. Each firefly blink is a signal to potential female mates of the same species. Fireflies produce the light in their light organ located under their abdomens. Unlike lightbulbs that produces light and heat, the light fireflies produce is called “cold” light with very little heat which is good allowing them to survive this process known as “bioluminescence”. 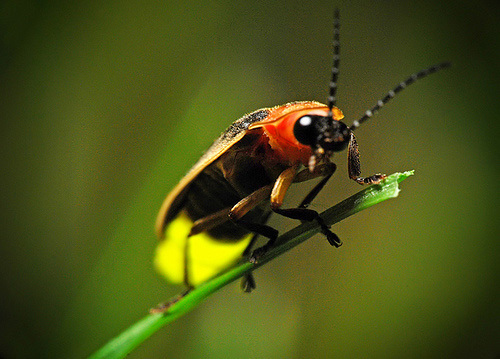 Fireflies have inspired brighter LEDs. The bioluminescence process has been of great interest to engineers as they investigate ways to produce computer screens and TVs that use less energy. 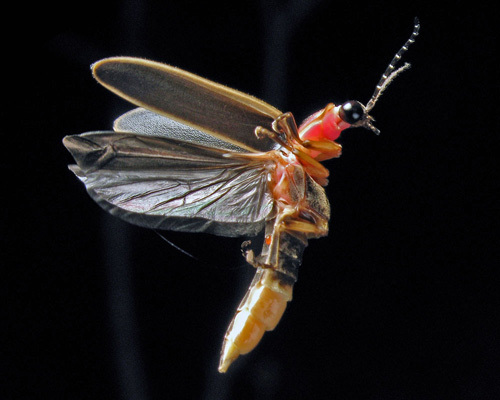 Luciferase and Luciferin, two chemicals found in the firefly’s tail, are being used to detect tumor cells, bacterial and viral infections, and in the study of many diseases from cancer to muscular dystrophy. Sadly the firefly population has been dying out mostly due to light pollution, reduction in habitat and human pollution such as pesticides. If you want to join the Firefly Watch in your area visit the Boston Museum of Science website to learn about it. As for me, I will patiently wait for the fireflies to show up in my neighborhood and then enjoy the show.